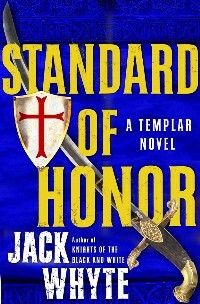 Standard of Honour, or Honor if you’re American, is the second novel in the Templars Trilogy and it deals with the Order of the Temple at the peak of its power, when it functioned as the regular, standing army of the Catholic Church and formed the backbone of the Armies of Christendom in the Middle Eastern war known as The Third Crusade, the war in which the medieval paladin King Richard the Lionhearted of England led the allied Christian armies against the combined forces of Islam commanded by Saladin, the first Caliph of Syria and Egypt. The previous Crusade had ended badly, with the Frankish (i.e. 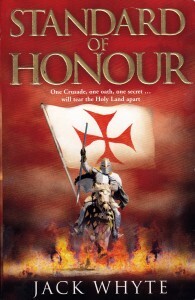 Christian) army, including most of the Templar Knights in Outremer, being wiped out at a place called the Horns of Hattin. As the inevitable result of that crushing defeat, all the hard-won cities of the Holy Lands, including the Holy City of Jerusalem itself, had been lost to the followers of the Prophet Mohammed. Richard of England sailed at the head of an enormous army to avenge that earlier defeat, and such was the character and individual charisma of each of the the two opposed leaders, Richard and Saladin, that the war between them has been romanticized more than any other in history. Once again, the protagonists of this novel belong to the Franco-Scottish St Clair/Sinclair bloodline, and the story is presented through their eyes.